Keeping in the mind various requirements of our clients, we are offering premium quality Plastic Color Sorter for Recycling Industries. Our offered sorter is manufactured utilizing top notch quality components and innovative technology in line with industry norms. 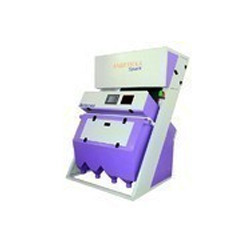 Used for sorting color distortion, this sorter is available in variegated sizes and specifications as per the requirements of our customers. We offer this sorter to our clients at market leading prices. Our organization has gained recognition as the affluent manufacturer, trader, exporter, importer and supplier of a qualitative range of Color Sorter for Plastics. The offered sorter is manufactured using quality tested components and advanced technology in adherence with industry norms. Furthermore, this sorter is available in various sizes, designs and specifications as per the needs of our clients. Clients can avail this sorter from us at nominal prices. Looking for Plastics Color Sorter ?